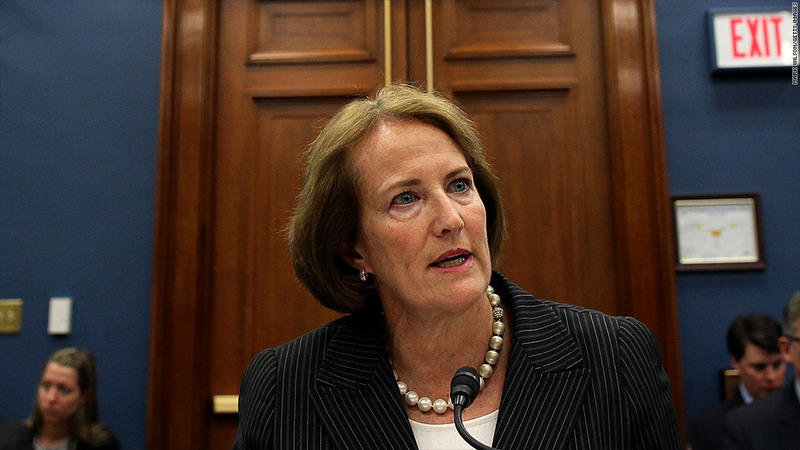 SBA Administrator Karen Mills announced plans to resign in an e-mail to agency staff. The head of the U.S. Small Business Administration won't be staying for President Obama's second term. SBA Administrator Karen Mills announced her plans to resign in an e-mail to agency staff on Monday. The federal agency would not say why Mills is leaving her post, noting only that she will be returning to her home state of Maine. The White House did not immediately name a successor. In what was largely a symbolic move to show the importance of entrepreneurship in the economic recovery, President Obama made the SBA chief a cabinet-level position last year. The SBA's primary purpose is to help small businesses get access to funding via government-backed loans from private banks. That task became extraordinarily difficult during the recession, as banks reeled back from their normal lending practices. Mills assumed her post as chief in April 2009 and led the SBA while businesses scrambled for loans. During her tenure, the SBA took part in loans worth more than $106 billion to at least 193,000 businesses. The agency is also charged with helping small business land federal contracts. In her note to SBA employees, Mills boasted about the agency's work, noting that federal contracting to small businesses also increased during her years there. She said businesses secured $286.3 billion in federal contracts in the last three years, $32 billion more than the previous three. "Together, we got capital into the hands of small business owners and entrepreneurs when they needed it most," Mills wrote. Various surveys and studies, such as those conducted by the National Federation of Independent Businesses, have tracked the improving economic environment for the country's 28 million small businesses. But while the credit conditions have vastly improved, they're still not at pre-recession levels, according to the NFIB's economic trends report. In Mills' tenure, Washington annually missed its goal to award 23% of all federal contract dollars to small businesses, continuing a trend that began in 2005. In a statement thanking Mills for her service, President Obama noted Mills played an instrumental role in the passage of the 2010 Small Business Jobs Act, which included several temporary tax breaks. "Over the last four years, Karen has made it easier for small businesses to interact with the federal government by reducing paperwork and cutting through red tape," Obama stated. Mills said she will not leave until her replacement is confirmed by the U.S. Senate. If that happens anytime soon, whoever that is will also be tasked with overseeing disbursement of SBA help for victims of Hurricane Sandy. Small businesses have complained that federal help since the October storm has been slow. An agency spokeswoman said there's no word on what Mills will do when she returns to Maine. Before assuming her role as SBA chief, Mills was president of MMP Group, an investment firm that focused on consumer products, food and textiles. She has also served on the corporate boards of Arrow Electronics (ARW) and Scotts Miracle-Gro (SMG).